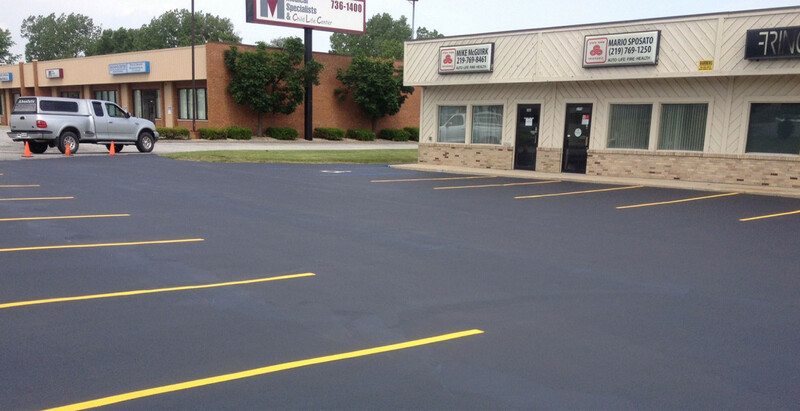 Whether it is your home driveway or commercial parking lot, Absolute Property Services in Merrillville, Indiana has the professional sealcoating team that can get any pavement looking brand new. We currently offer quality sealcoating administered by a qualified staff dedicated to customer satisfaction. Our highly skilled staff only uses premium products to ensure a long life for your residential or commercial pavement. We take pride in our work and it shows, from professional landscaping to quality seal coating, Absolute will make any outside property look beautiful. Along with seal coating, we also offer fertilization, aeration, and seeding services to get your lawn luscious and green. We offer custom landscaping design and all around residential and commercial property landscaping. Absolute Property Services uses new equipment to cut grass and can make your lawn look like a professional football field. All of our work is done by a expert team using only high quality products.